This working involved a black candle featuring the image of a snake, coiling around the length of the candle from top to bottom. This represents many meanings in ritual use, allowing the working to focus on anything from spells of removal, hex-breaking, and reversal. Let me load, dress and inscribe this candle for your situation, fixing it to bring about your desired goal and outcome. I will burn this candle over three days, offering the correct offerings to the deity or spirit best suited to aid your situation. 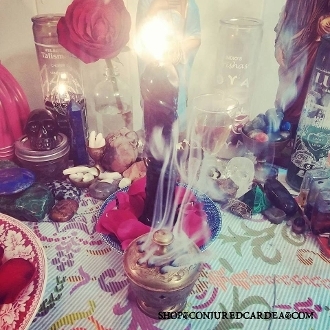 Let this powerful candle working bring the success to your situation, by twisting it in your favor! A full report containing 5-10 photos will be emailed when the work is close to completion or upon completion. This is a 3-5 day service. YOU WILL NOT RECEIVE A REPORT UNTIL AT LEAST 3-5 DAYS AFTER YOUR APPOINTMENT DATE.